Last Friday, one of my dearest friends, Charlotte, married her longtime sweetheart, Katie, in an intimate courthouse ceremony. The bride was beautiful, the butch groom very dapper, and all attending guests were there to share in what was a really lovely afternoon. Since Charlotte and Katie’s families are spread out, they are doing things a bit non-traditionally, but no less thoughtfully. While their formal ceremony was Friday, they will be having a party in July for friends and loved ones in the Twin Cities and then another with family at a gathering between their two homes come the fall. So many opportunities to celebrate! Over the next month and a half, Charlotte and I will, largely, be planning what their celebration for friends will look like and, chances are, you’ll see some of the projects we undertake for it here. What a happy way to cultivate blog content at the same time as organizing what will be an amazingly fun, love-filled day! My Pinterest boards and I are already bursting with ideas! 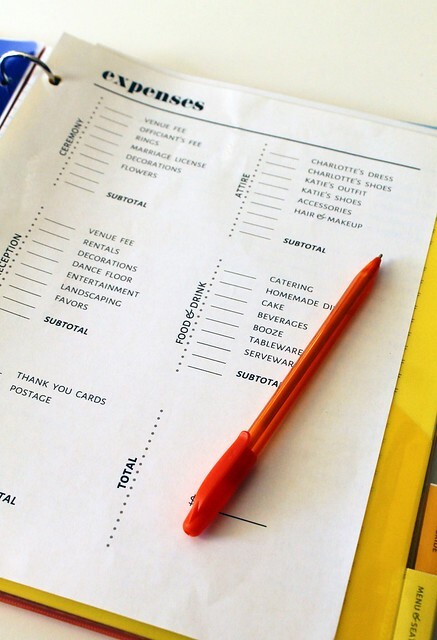 Planning a party, even one that is informal and fairly small in size for a wedding celebration (about 40 people), is a lot of work and, herein, my Virgo brain sees an opportunity for organization. Enter: The Wedding Binder. A wedding binder is many things I love all rolled into one: structured, informative, tidy, an excuse to buy cute office supplies, etc. I know that holding up these kinds of qualities probably makes me sound like a total stiff (do people still say that? 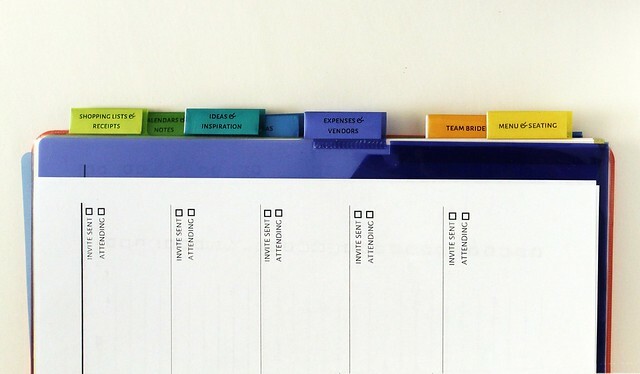 ), but it’s only in project planning that I hold so dearly to these ways. How else will one remember if they sent a “thank you” card to their aunt or remember where they put the receipt from the caterer? If you have a wedding binder, everything has a place, eliminating one stressor right off the bat. 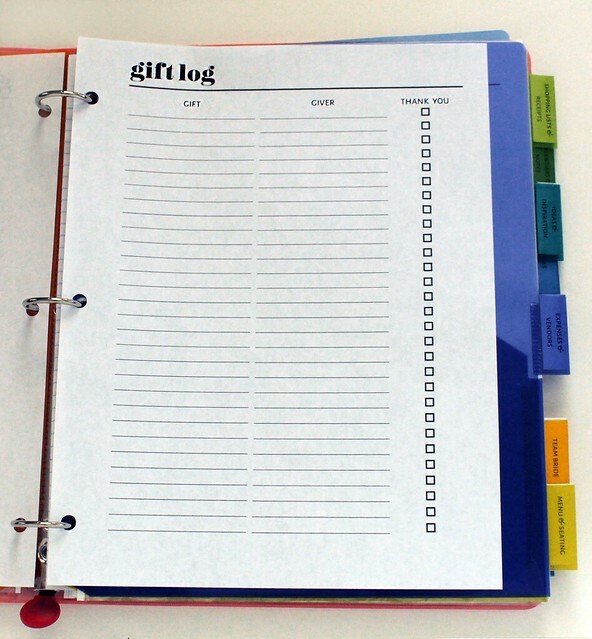 Could you buy a wedding binder? 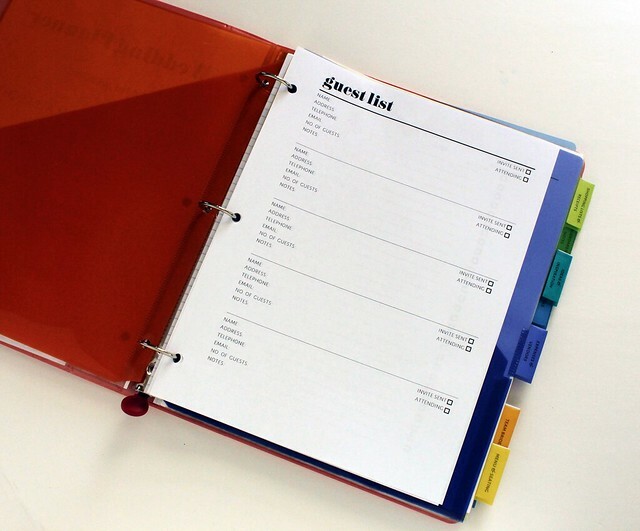 Of course, but there are so many templates online to make your own, and now this one, that printing out some pages and putting them in a binder along with some dividers is time well spent. 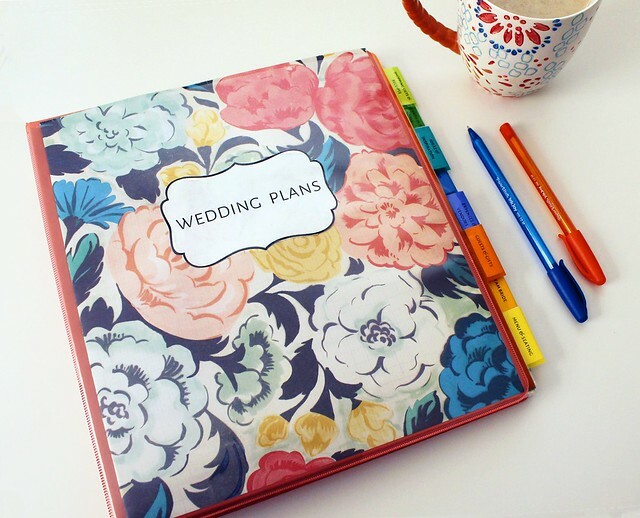 Not only does it save you money, but making your own wedding binder also allows you to really customize it to your needs. When I made this binder for Charlotte and Katie, for example, I didn’t have to include space on the “Expenses” sheet for ceremony costs because, aside from the marriage license, there weren’t any. 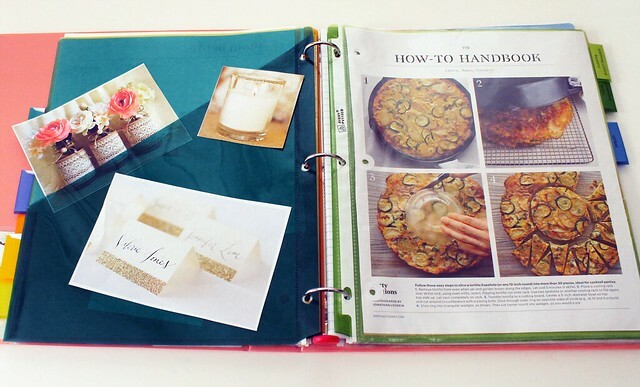 Charlotte and Katie’s party, as many small weddings are, will also largely be a very DIY affair, so I knew it was also important to include space in their binder where they could collect visual ideas from magazines or Pinterest to inform future table design or what have you. I also created a section called “Team Bride” where Charlotte can identify friends in her network who she can ask to assist with parts of the party, i.e. here she can make a note that our other friend, Katie, will do Charlotte’s hair and make-up that day. Since music is so vitally important to the small, DIY wedding, I made sure to also create a “Soundtrack” page where they could jot down ideas that came to them for “must-haves” to hear on the day of the reception. On their wedding site, Charlotte and Katie asked guests to suggest songs when they submit their RSVP – a great idea! – so this is a landing place for those selections too. For smaller, DIY parties like this one, keeping organized, budgeting well, and relying on friends for additional help and services depending on where their strengths lie are all key to pulling off a beautiful day. To those of you out there who have planned (or are planning – congratulations!) a small, but special day, what other tips do you have to keep everything and everyone reigned in and organized leading up to, and on the day of, the main event? A Femme Fraîche Original: Free Mother’s Day Printable Image! If you haven’t yet figured out that sentimental something to give your mom this Mother’s Day – Pssst! It’s this Sunday, May 12th! – I’ve got you covered! Download and print the lovely, little above image that I handmade in honor of the day and gift it however you choose. I’m giving this to my own mom as a framed piece; I printed it on some 5-inch by 7-inch matte photo paper, put it in a pretty little cherry wood frame, and sent it straight to New Jersey with my DIY garden markers for the occasion. But you could also turn this into a card or even your mom’s desktop wallpaper! 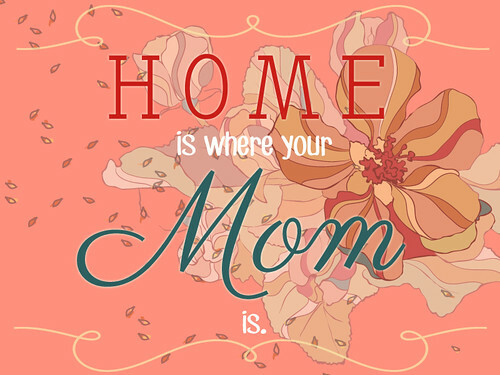 For me, the message of “Home is where your mom is,” is resoundingly true. 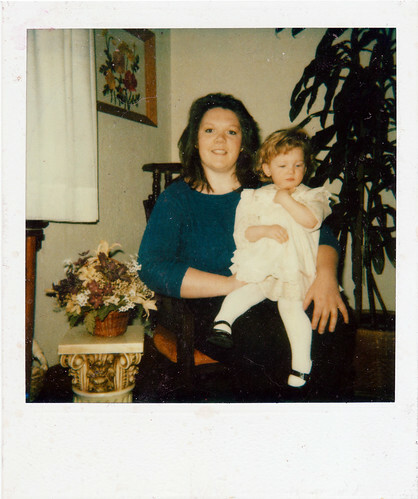 I may have my own home, the one I’ve made for myself, the one I share with Bear, but my sense of “home” – what that feels like to me, what it is – has been cultivated almost single-handedly by my mom (also known as the gorgeous lady in the above photo holding onto a miniature me). So much so, in fact, that the concept of “home” and “mom” feel inextricably linked for me, even when my physical home doesn’t still include her. This message seemed the perfect way to articulate that the truest sense I have of what “home” is, always includes her influence and her presence. If I can’t be with her to celebrate the day, at least I can remind her of these things from afar. On an end note, I also want to just say that Mother’s Day can be hard. I know that not everyone has a good relationship with their mom, or one at all, and that not everyone has a mom to begin with, or a mother who is living, or, frankly, feels better off without theirs. That’s real stuff and I get it; Father’s Day for me is intense for some of these same reasons. Holidays that focus on family, that reinstate specific gender roles, traditions, sets of “values,” and that favor heteronormative unions and familial structures make days like this Sunday sad and complicated for a lot of people. So, whether you’re celebrating this weekend or not, or if you’re a mom or not, I hope that, either way, your weekend is lovely and spent surrounded by sunshine, the people that make you feel best, and the beauty of spring having sprung.